Day 2 began with coffee. I had a whole list of things to do and eat. I was determined to tick everything off on my to do list. So I picked up an Almond Croissant from the Starbucks right outside the hotel, hailed a taxi and off I was to the ToTT Store at Suntec Mall. I will tell you why I mentioned ToTT aka Tools of The Trade store. ToTT is a huge kitchenware store, so obviously I had to mention it. I was actually in the store for 2 hours figuring how much budget and space in my bag I have so I can narrow down the things I need to buy. After much deliberation and confusion and conclusion I bought what I needed and headed for lunch. Conclusion – if you would like to buy good kitchen equipment head over to ToTT. According to my research Hainanese Chicken Rice is the national dish of Singapore. Traditionally you should go to Maxell Road Hawker Centre. But as I was short on time, I had to eat at the Food Court in the mall, which was delicious none the less. Hainanese Chicken Rice is Chicken poached in broth preferably wrapped in Pandan leaves flavored with ginger. The rice is also made with adding the same broth. And the broth is also served as the soup on the side. Which is pretty darn good! Chicken was perfectly cooked and juicy. The soup was something I could just put it in a bottle and keep sipping it the whole day. The salad and rice was good. It was a perfect comfort meal and the portion was huge. After lunch I continued to roam the mall as I had to buy and eat other things. 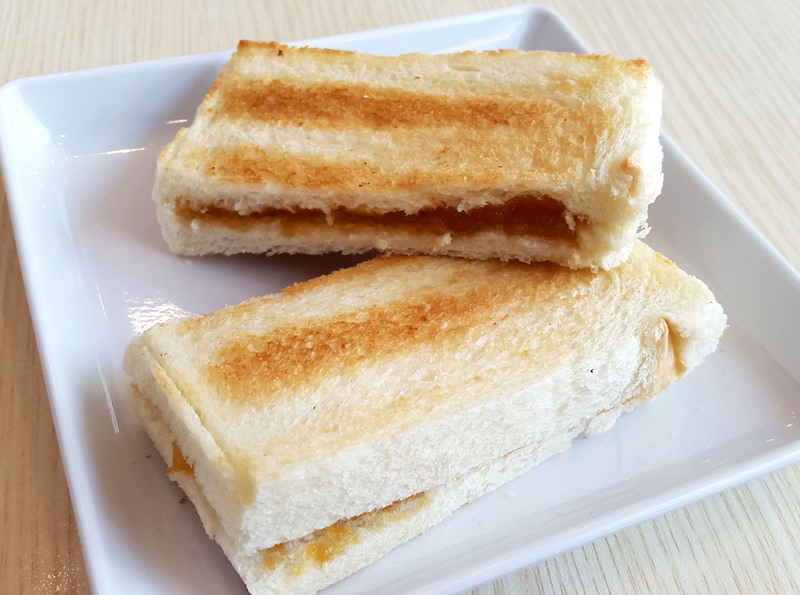 Kaya Toast is a famous snack sold in Singapore. It is a jam made of coconut and eggs. Again it is a must have. And probably most widely available here. I preferred it at the Toast Box. Toast Box has its outlets everywhere so I would really advise not to miss it. Kaya toast is a delight with the perfect amount of kaya jam and salted butter making it perfectly sweet enough. I even bought kaya jam bottles to take back home from Toast Box, again I advise you do the same. Also do try their Peanut Butter Toast, I took that as a takeaway and enjoyed it as my midnight snack at the hotel. Now this isn’t a Singaporean delicacy. But I happened to spot Robert Timms outlet, which is a famous coffee outlet from Australia. At the entrance I saw a doodle of the huge crazy milkshake and I decided to check it out. I wanted to know what is the fuss about those crazy huge milkshakes. So I ordered a coffee milkshake. Well let me just say it was glorious! 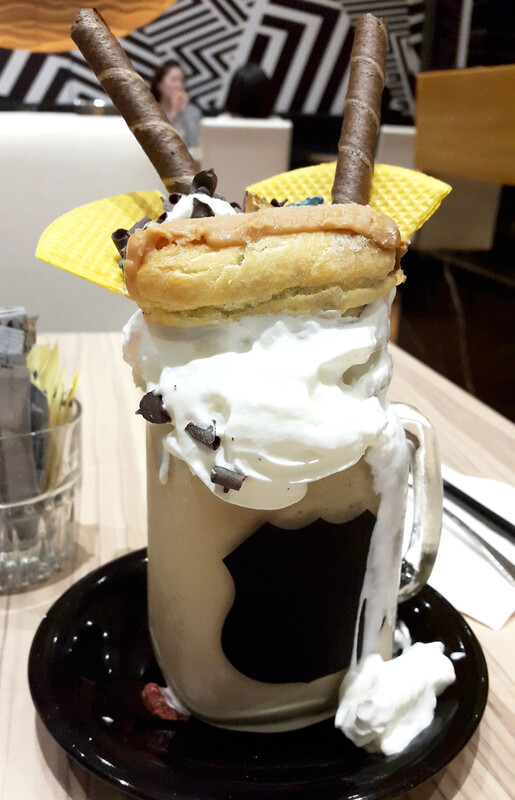 Topped with overflowing whipped cream, Coffee Eclair and chocolates, this thick and delicious milkshake gave me the perfect coffee kick I needed to continue the rest of my day. After the milkshake, I went to Marina Bay Sands. And after all the sight seeing, I went over to their Food Court for early dinner. 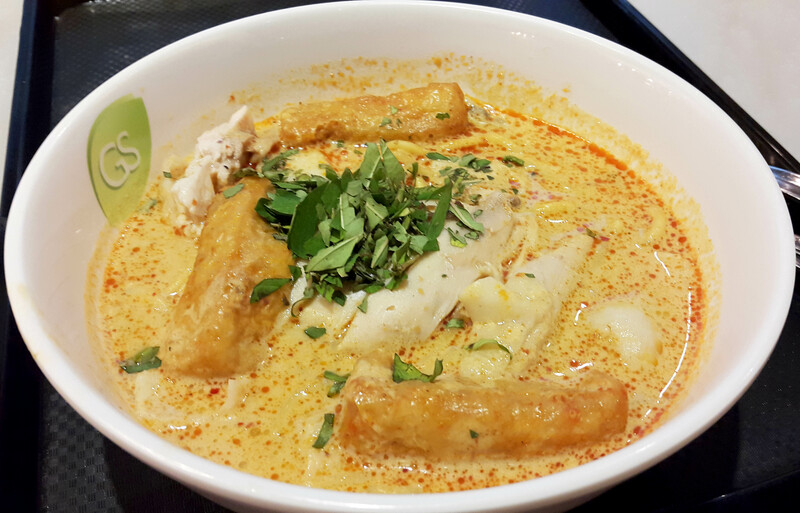 Again a must have dish at Singapore is the Laksa. I had the Curry Laksa which is the tastiest spicy soup made with coconut milk, chicken, bean curd puffs, shrimp and noodles. It was a perfect hearty meal to end the day with. There it is my 48 hours in Singapore, where I tried to cover as much as the amazing food Singapore has to offer. Let me just say I didn’t cover the half of it, but I tried. The best part of Singapore’s food scene is that it has something to offer from all the Asian countries, which makes the experience all the more exciting and worthwhile. If you love food and especially want to try all the possible dishes that Asian Cuisines have to offer I suggest a trip to Singapore is a must.